Maya was three months old when I got her, and about 20lbs. 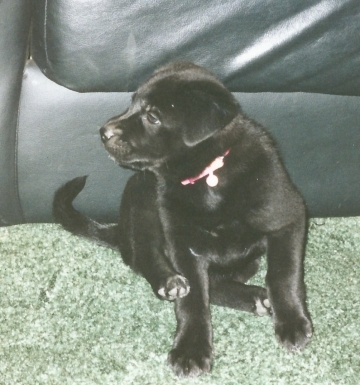 What a cute little booger she was! Maya’s adoption papers put her birthday as August 25th, 2007. 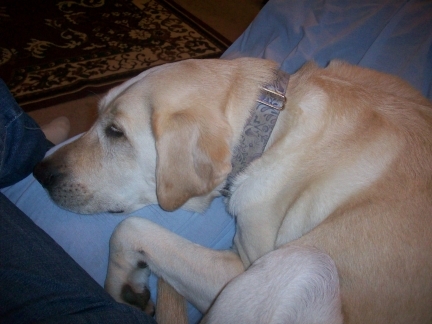 However, it wasn’t until right after Thanksgiving of 2007 that I got her. So while I am giving thanks for all my blessings this holiday season, I have an extra special reason to be thankful – my Maya Papaya. 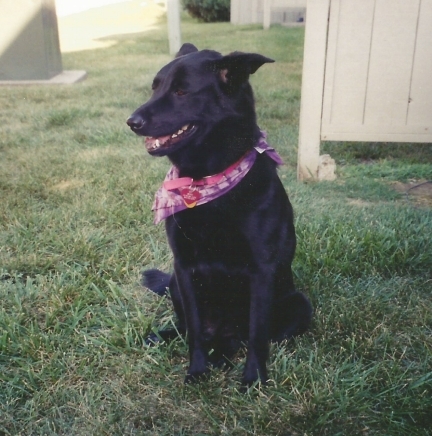 Sephi had been my only dog for many years. I’ve wanted another dog for some time, but kept putting it off. Around October of 2007 my boss started allowing me to work from home. This gave me more of an opportunity to take care of another dog. I did not go through a shelter or rescue group because I had a misconception about them not allowing a person who lived in a one bedroom apartment to adopt a large dog, especially if that person already had one large dog. (I knew I wanted a larger dog, at least Sephi’s size.) My misconception arose because I used to work at an animal shelter years ago, and their policy was very strict about this. 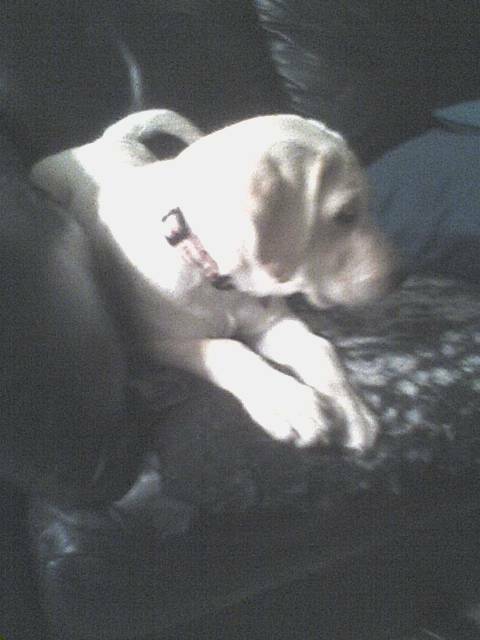 I contacted the woman who posted about this cute Labrador puppy on craigslist right away, and got a quick response. I less than 30 minutes after speaking to her, I made an ATM withdrawal for some cash and drove on over to meet Dixie. The first thing Dixie did was jump and lick like the maniac puppy that she was. The woman said, “Oh, she never does that!” And she kept saying it over and over again as though she thought I wouldn’t want the puppy if it was too rambunctious. Perhaps someone else had taken a look at Dixie and decided she was too much. 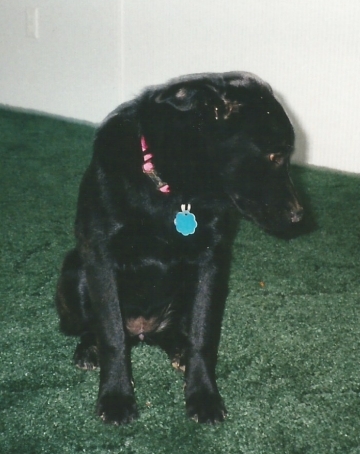 But I know puppies and had no problem with Dixie’s excited behavior. My mind was made up. How could you not fall in love with such a cute little stinker? I spoke to the woman a bit about why she was giving up the puppy and she said it was because she just didn’t have time for it. I noticed the woman had two toddlers and an infant to care for and completely understood. This woman had her hands majorly full. I asked her if there was anyone else showing interest in the puppy and she said no. So she gave me Dixie, the rest of Dixie’s food, and Dixie’s adoption papers. 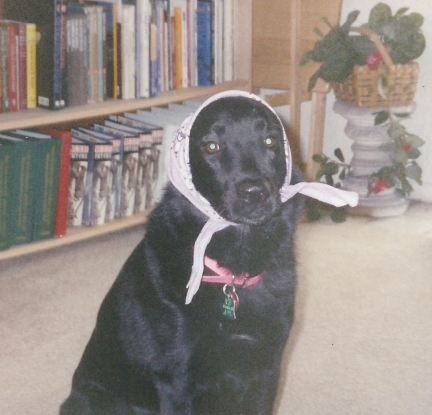 I gave her the money, which was the exact same amount she had paid to adopt Dixie, and we were on our way! On the way home, I realized I should have gotten a dog seat belt for Dixie. She kept trying to climb in my lap and I ran a red light while trying to push her away. Thank goodness nothing happened! 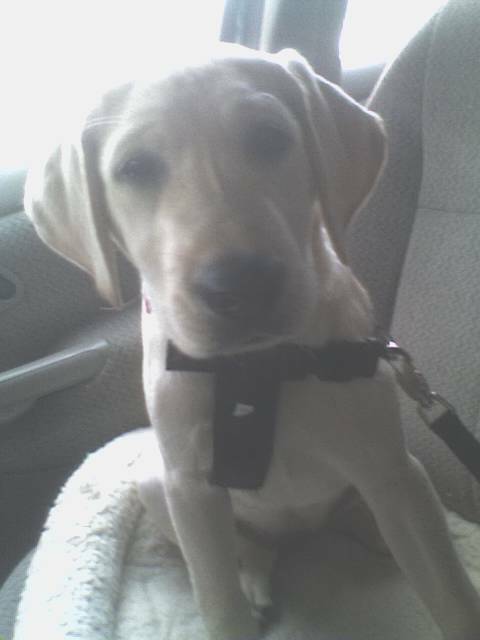 Phone photo of Maya’s second trip in the car after I got her a dog seat belt. She’s always had such a big nose. When I got home, I started trying to think of a different name for Dixie. Check out my post on how I came up with the name Maya. Here we are, six years later, and Maya and I are as happy as can be. I shudder to think about the kind of life Maya could have led if that woman hadn’t decided to give her up. Maya is much happier, I am much happier, and I’m sure that woman was much happier. All-in-all, it was a decision everyone was thankful for. Maya was a gift to myself. I want to mention that if you look for a dog on craigslist, be very careful. 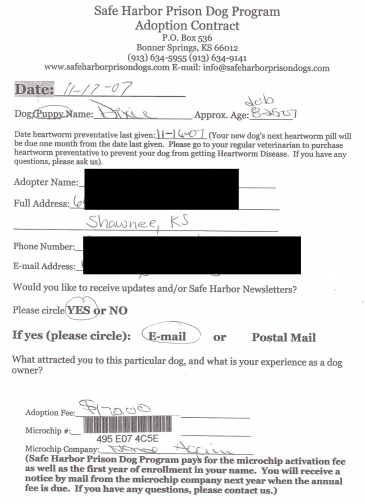 There are breeders out there posing as rescue groups. 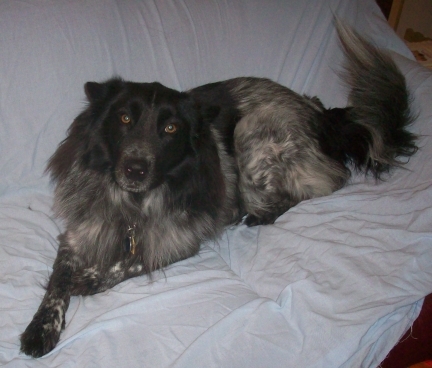 I paid $150 for Maya, which was a reasonable adoption fee for a dog that was spayed and had her booster vaccines. I received a copy of her medical records along with her original adoption paperwork. Generally, breeders posing as rescues charge a lot more and call it an “adoption fee” but don’t include spaying or neutering and may or may not include vaccines. Maya’s adoption papers. She was actually adopted at PetSmart and I have a copy of that document too. PetSmart doesn’t adopt out dogs, but they invite rescue and shelter dogs over on the weekends. 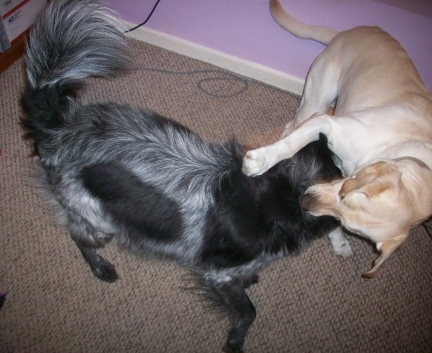 Believe it or not, Maya and Pierson do not play together often. 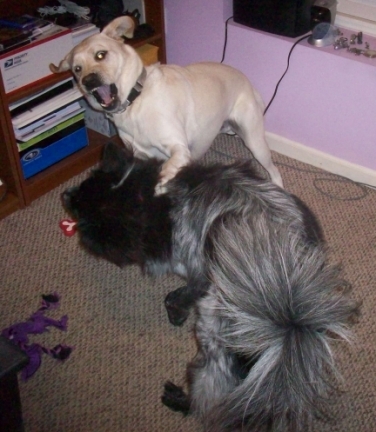 Maya thinks Pierson is just a little too rough, and he is. So if she is trying to play by herself, and he butts in, she stops. But the other day was different. Maya was either very bored or just in a really good mood. They played together for several long minutes, long enough for me to go find my camera and snap quite a few photos. 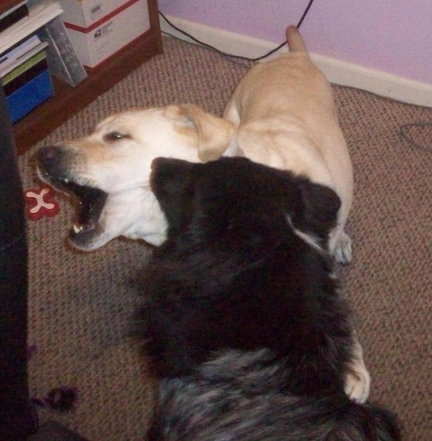 When Pierson plays too rough, he grabs the side of Maya’s face and pulls. Ouch! Even though Pierson sometimes hurts her, Maya doesn’t cry out. But this day, she was really giving him what-for. I’ve got you now, Mr. Pierson! Have you had enough yet? How about we slobber up some of that fluff of yours. But Pierson slips away. Maya has to try again. But Pierson is the one who takes Maya down. He always wins… but only because Maya lets him win. No dogs were hurt in this activity. It was just good, slobbery, and loud fun. Pierson loves the squeak of the Invincibles Gecko dog toy. 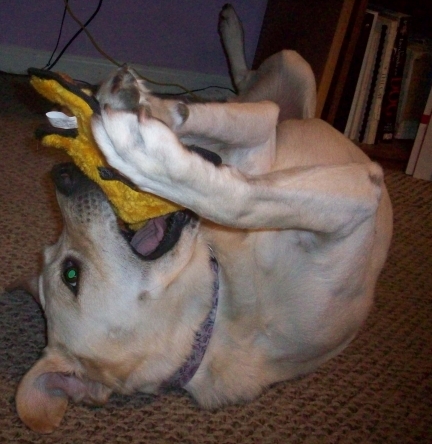 Maya likes to play with her Invincibles Gecko dog toy while on her back. 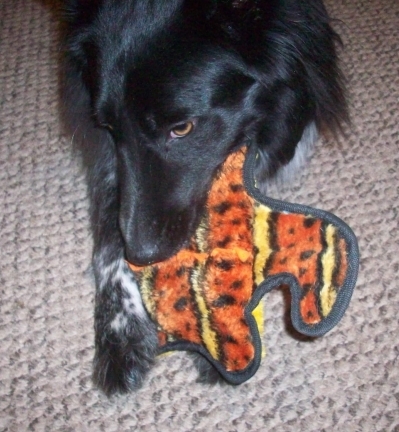 One thing I love about the Invincibles Gecko dog toy from Kyjen is there is no stuffing to tear out. 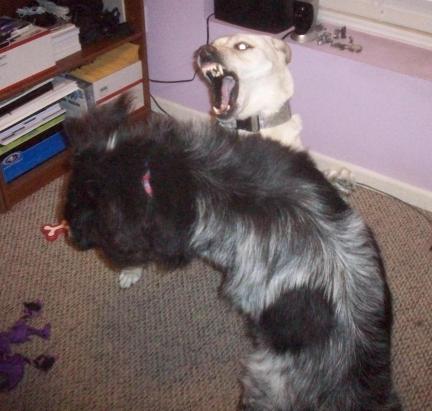 The squeakies are big enough that if the dog takes them out, they can’t swallow them whole. And the squeakies work even after your dog punctures holes in them with their teeth. The first Invincibles Gecko I bought for Maya and Pierson was the small orange one. It lasted a little over a month. Maya eventually took the squeaker out, so I threw it all away. Then my friend Joanne in the UK bought them the large blue Invincibles Gecko from Kyjen a couple of months ago. 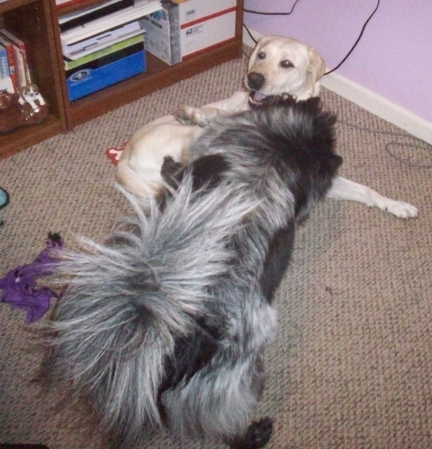 It is still intact and Maya and Pierson play with it regularly. 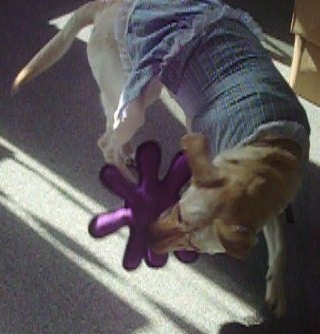 Maya enjoys her Tuffy’s octopus dog toy. Pierson still has this Tuffy’s dog toy from nearly two years ago when I first brought him home. The first large Tuffy’s I bought was the purple octopus. Sephi was the first to get the stuffing out of the top of the octopus’ head. But as of today, the octopus arms are still undamaged and still have their squeakers. Maya and Pierson don’t play with the octopus so much anymore. They mostly play with the large Tuffy’s gear. Actually, Pierson plays with it more than Maya. It was one of the first toys Pierson played with when I first brought him to his new home. 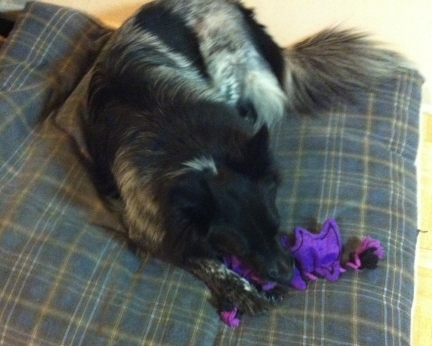 After almost two years, the Tuffy’s gear dog toy is still completely intact. 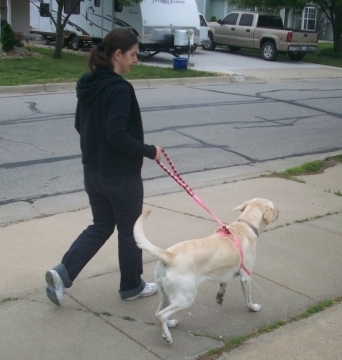 Squeaker mats are another product from Kyjen. Maya and Pierson love the squeaks. Every single square has a squeaker in it. That is 16 squeakers!!! The first squeakers Maya and Pierson were able to get out were the ones on the four corners. Today, 10 squeakers are still embedded in the mat but only one squeaker still squeaks. I don’t have a good photo of Maya and Pierson playing with this because now it is mostly a raggedy square. But they do still play with it. 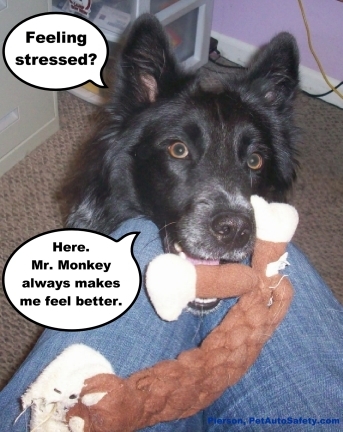 The Mr. Monkey dog toy in this photo caption is the Kong Braidz. 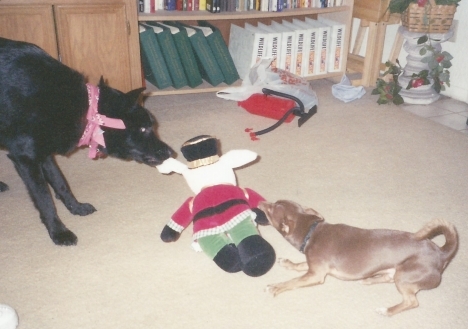 Maya and Pierson love felt toys as much as plush dog toys. The Kong Braidz is their most favorite. The first one I bought was the pink dog. Of course, the very first thing Maya did was pull off the stuffing filled head. Now it is just a knot of pink felt. I bought the monkey Kong Braidz next. Again, it didn’t take long for the head to be destuffed. The legs are gone too. 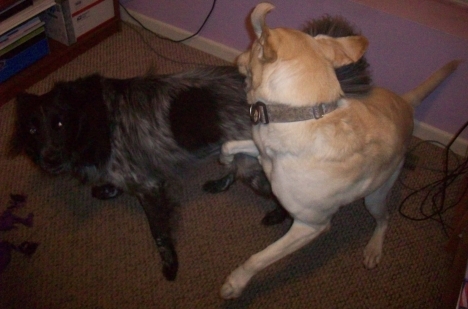 But Maya and Pierson still love to play with it. Pierson most of all. The bottle buddy dog toy is yet another toy from Kyjen. It has no stuffing in it, which is great. It comes with a plastic bottle inside that makes crinkle noises when the dogs chomp on it. Maya LOVES this toy. It didn’t take her long to chew off the ears and feet or to crunch the bottle down flat, but the case is still in one piece. And it is easy to put in a new plastic bottle. This video has Sephi in it, so it is a bit older. But it shows how much Maya loves the bottle buddy dog toy. Pierson likes this toy too, but not as much as Maya. 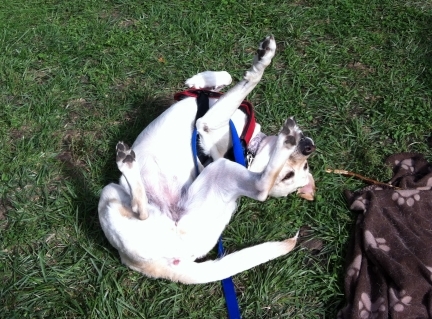 What is your dog’s favorite dog toy? I was not paid for this post. However, the links above go to my Amazon a-store which is an Amazon hosted store that gives me a small commission for purchases originating through my a-store. The a-store is a smaller version of the full Amazon site, but it is still an Amazon site. Okay, so this post isn’t completely wordless. (Is it ever?) But I have to tell you what these photos represent. 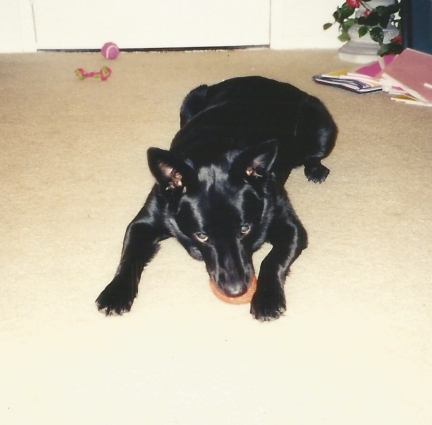 A couple of months ago, Pierson entered a Best Mutt contest held by Deborah Taylor-French on her fabulous Dog Leader Mysteries blog. And guess what? He won! So here are some cute photos of Maya and Pierson with the prizes Pierson won. 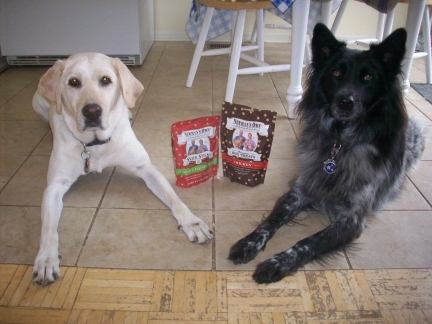 Pierson won these great dog treats, but he’s being a good little brother and sharing with Maya. 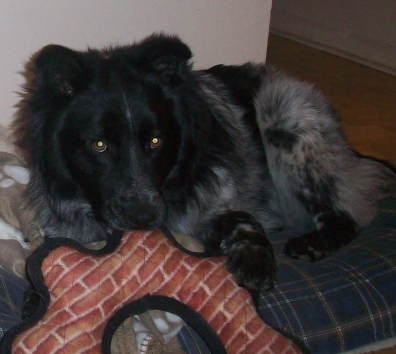 Pierson really loves the bat dog toy he won from Dog Leader Mysteries blog. Sorry I haven’t posted in a while. I haven’t been feeling well. But trust me when I say this is good news. No, I’m not pregnant. But that would be good news too. No, my not feeling well is good news because it means the new treatment I am trying for my fibromyalgia is working. I will explain this further on. 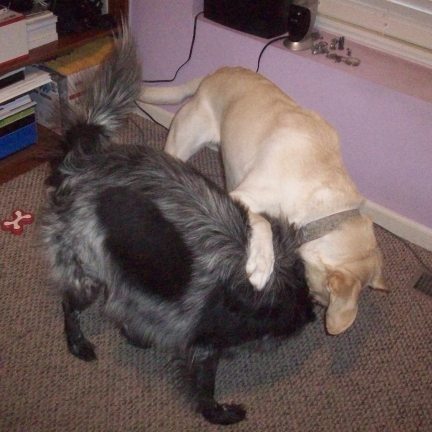 But first, let me tell you about my fibromyalgia and how my dogs have helped me manage the fibromyalgia symptoms. I was diagnosed about five years ago but have had the symptoms much longer. It started with terrible headaches and stiff sore muscles. Fibromyalgia also caused me to feel excessive fatigue, have difficulty in concentrating, and occasional sleep disruption. Although the symptoms likely came on gradually, it seems they intensified all at once about seven years ago. I didn’t know it was fibromyalgia at that time and I swear there were days when I thought I was dying. None of the doctors could figure out what it was. Many doctors just chalked it up to all being in my head. I actually had one doctor roll her eyes at me! 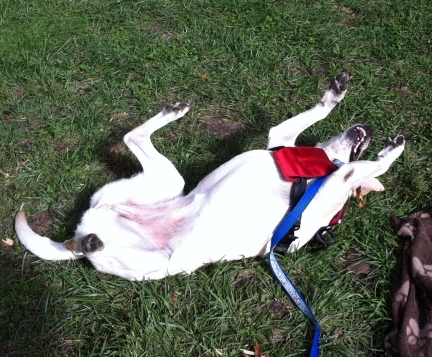 How dogs can help relieve stress. 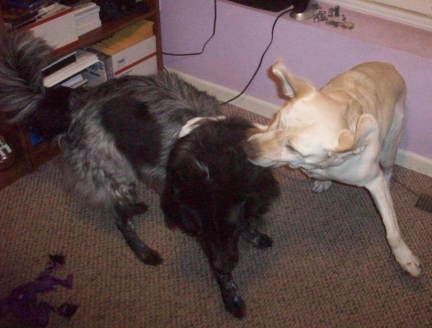 My dog, Sephi (and shortly thereafter Maya) helped me too. Stress can cause fibromyalgia symptoms to flare up. Since I was permitted to work from home, Sephi and Maya were tremendous at providing stress relief. No more annoying co-workers, bosses, arrogant agents, or angry insurance customers to trigger stress. 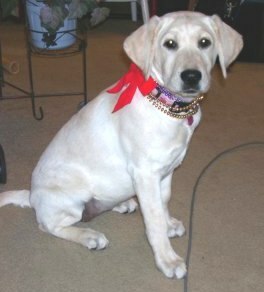 The only stress I was subjected to was the stress of trying to potty train my little trouble-maker puppy Maya. But believe me, dealing with a pooping puppy was a heck of a lot less stressful than dealing with work crap… pun intended. Maya helps make sure I get plenty of exercise. I heard another way to help manage fibromyalgia symptoms was to get more exercise. When my symptoms flared up to the point that I felt like I was going to die, the last thing I wanted to do was exercise. But once I learned certain kinds of exercises can help I started forcing myself to work out more. That was good news for Sephi and Maya because I took them on a lot more and longer walks. Thanks to being allowed to work from home, I was able to walk them at any time of the day. So providing stress relief and giving me an excuse to get more exercise is how my dogs have helped me manage my fibromyalgia. Today, I still have bad days, but nothing compared to what I was feeling seven years ago. Still, I’d like to be done with fibromyalgia. So when I heard of a possible cure, I just had to try it out. It is believed by some that a possible cure for fibromyalgia is the GuaiProtocol method. Now this is a controversial treatment and there is some debate about whether it really works or not. But what do I have to lose for trying it? Since the drug is an over-the-counter drug, there is very little risk involved. The only downside is that I know the drug is beginning to work when I start to feel worse. Yes, that’s right, worse. They say you start to feel worse because your body is going through detox. Makes sense. I’ve been on the drug for nearly a month now. And in the past two weeks my fibromyalgia symptoms have intensified. Even though I feel worse physically, I feel better mentally knowing that I am finally on the road to recovery. Although I’m not starting on the trend to feeling better yet, blogging makes me happy and I have missed it these past couple of weeks. Meanwhile, my dogs are still helping me. Despite my painful headaches and muscle aches, Maya and Pierson make me laugh and keep me in good spirits. They constantly remind me of the necessity for walks and provide comfort by cuddling with me. Maya & Pierson are not allowed in the living room. 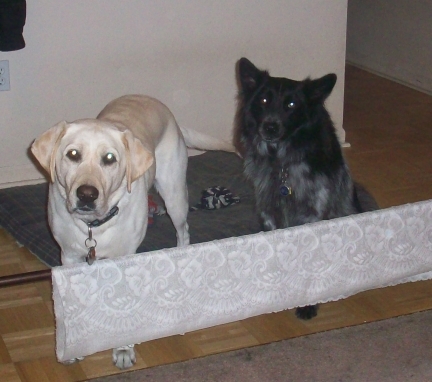 But when they see me bring out the blue sheet for the couch, they eagerly await the special cuddle-time. My dog Pierson enjoys sitting with me on the couch for special cuddle-time. Maya usually tries to sit on my lap when she is allowed on the couch. But this time she is content with laying by my side. Maya and Pierson may not be official therapy dogs or canine assistants, but they’re doing a pretty darned good job of taking care of me. 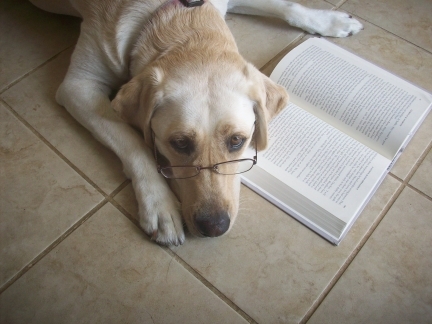 Does your dog or cat help you deal with health issues?